Everyone has the occasional rough day. But if you hear these phrases regularly, you might be in a toxic work environment. It’s a situation familiar to many of us: That moment when something just feels off. You have a less-than-great feeling about your work environment, and then, someone utters a phrase that gives you a sinking feeling. That’s the feeling that indicates you might be in a toxic work environment. But how can you be sure, exactly? What do these signaling phrases sound like? We collected the seven that we’ve heard the most — outside of HubSpot, of course — and compiled this list to help you figure out if your instincts are correct. When you work hard, it’s no surprise that you might occasionally have to stay at the office past your typical “quitting time” — like when you’re on the verge of launching a new product, campaign, or event. But when you hear about colleagues doing this regularly — especially when they speak boastfully about it — that’s a sign that there might be something not-quite-right with the workplace culture, and its approach to work-life balance. Take a survey conducted by Staples, for example. It showed that 55% of employees feel like they can’t leave their desks for a break. Sure, 86% also said that these breaks would actually help their productivity — and yet, more than half are hesitant to take them. When we hear our peers, colleagues, and managers habitually speaking of late nights at work and industrious weekends — the opposite of taking time to breathe and recharge — it sends the message that it’s expected of everyone, perhaps even implying that breaks and time offline are discouraged. And that, in a word, is unhealthy. In situations like these, it helps to ask for clarifying information. If there’s a colleague you trust, or if you have a good relationship with your manager, try asking if these hours are expected, or if it might be possible to disconnect on a given evening and weekend for a special event. It might turn out that this lack of work-life balance is not encouraged, and that what you’ve been hearing is the exception — not the rule. I wish everyone’s managers and teams led with that sentiment. After all, as human beings, we’re already disinclined to ask for help — so when we do and that request is met with a “but,” it’s not exactly going to encourage us to ask for support in the future. In these instances, I’ve found that it helps to lead by doing — even if this vocabulary or behavior is coming from someone who works above you. Many times, these phrases reflect someone feeling overwhelmed, in which case, it can be beneficial for you to proactively offer help. By actively displaying behavior that discourages a mentality of, “That’s not my job,” you may inspire others to take a similar approach. This one, for me, might be the worst phrase on the list. Is there anything worse than someone else being given credit for something you did — and then, that person accepting it without mentioning your role in the accomplishment? That’s one of the top signaling behaviors of a toxic work environment. It somewhat aligns with the tendency to have the negative parts of your performance pointed out, with little-to-no mention of the positives. When someone — whether it’s a colleague or a manager — takes credit for things that he didn’t accomplish alone (or at all), it can further reinforce a detraction from the things you’re doing well at work. That way, you’re not pointing it out in a way that comes from a defensive or finger-pointing manner. Plus, the response you receive to this conversation may indicate just how toxic the situation is. If, for example, the person didn’t even realize his error but retroactively recognizes it, you can work together to change that behavior. Have you ever heard the term “vacation shaming”? It’s exactly what it sounds like. According to research from Alamo Rent A Car, 47% of workers feel shame or guilt at work for taking time off — and 28% are reluctant to do it at all, fearing that they’ll appear less dedicated to their work. This phrase is similar to the first one we listed about working late, or not taking breaks. When the people around us at work brag about burning the candle at both ends, it reinforces the idea that that behavior is rewarded and that, therefore, we should be doing the same. But ultimately, that approach is detrimental. In fact, the top 10% most productive employees using business time-tracking software DeskTime have been found to take 17-minute breaks for every 52 minutes of work they put in. In other words — time off improves the quality of our work. A work environment that dictates otherwise gives us pause. Okay, so maybe it’s not phrased exactly this way, but here’s the point: the blame game is never a good sign. When someone appears to be unable to admit his or her role in things going wrong, it can instill fear in those around them — fear that they might be expected to accept blame in a situation for which they didn’t actually do anything wrong. And while studies show that many employers believe up to 50% of their respective workforces are comprised of unaccountable individuals, we’ve got news: Managers are responsible for being accountable, too, and for leading by example with it. In order to create a culture of accountability and eradicate the blame game, it’s important to begin by exhibiting that behavior yourself. You could write an entire book on accountability at work, for example, and if you don’t practice it yourself, no one will take that directive seriously. If this is new territory for you, start by asking what role you may have had in a less-than-desirable situation — and if the answer if something other than what you want to hear, take a moment to consider the feedback you’ve received, before reacting defensively. If all of the above phrases pointed to a single underlying result it would be: stress. When you’re facing a wave of discouragement to take time off, work reasonable hours, or have confidence in your performance, your lifestyle can start to suffer. You might not allow sufficient time to eat healthy foods, work out, or sleep. And when you combine those factors, the typical result is getting sick. Before my life at HubSpot, I once worked for a very small company where, every week, at least one employee was sick. And while I didn’t recognize it at the time, I know now that it was a sign of a toxic work environment. It might be normal for there to be an outbreak of a cold during a seasonal change or, say, flu season. 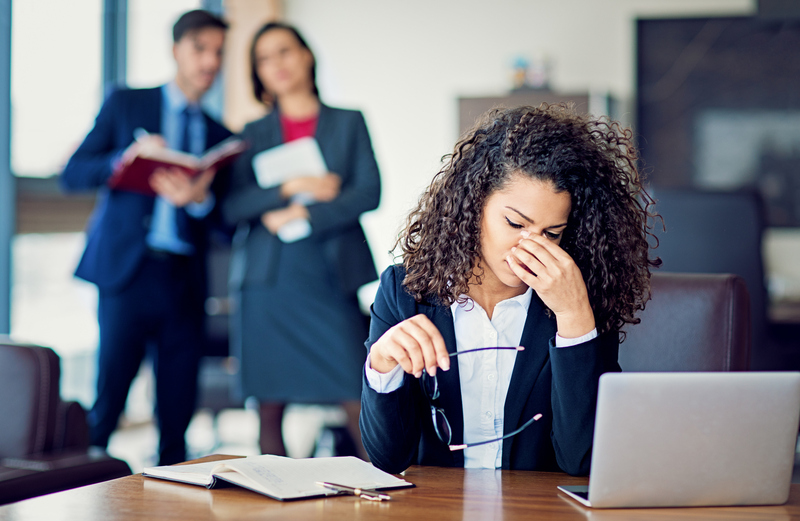 But if people in your work environment are regularly and frequently falling ill, it’s a sign that their immunity has suffered — that can stem from an unhealthy lifestyle, which is easy to fall into when the aforementioned items abound. I’ll cut right to the chase. According to a study performed by researchers at Indiana University’s Kelley School of Business, employees working under a micromanaging boss have a higher mortality rate. I wish I were making that up. But, seeing as we’ve already discussed the impact of stress and a lack of workplace flexibility on the ability to maintain a healthy lifestyle — it doesn’t exactly come as a surprise, then, that those working in these conditions die younger than their peers who are allowed more independence and balance in their jobs. Micromanaging is typically a sign of distrust. Constantly tracking your team’s behavior and disallowing autonomy communicates that you have little faith in its ability to succeed, which can result in a lack of confidence and motivation brought to tasks and responsibilities. If you find yourself in this type of situation — on either side of it — look to the results for next steps. Is your team’s performance lacking? If so, and your manager exhibits this type of behavior, it could be helpful to have a conversation about how this approach is negatively impacting your performance. For the other way around, look inward. Ask your team how you can help, and if stepping away might boost productivity. HubSpot's software helps businesses grow better.